So, I'm at a fairly large client that's moved from Lync 2010 to 2013. The server-side migration completed a while ago, and the client migration is in progress. Enterprise Voice is enabled for a select group of people. Some people have noticed that when they search for a specific Lync user, the only object that got returned was an object for their Active Directory administrative account that had only a phone number defined (not a Lync-enabled account). The Lync-enabled "normal" Lync entry didn't show up in the search, even though it did appear in the GALContacts.db file (the Lync locally cached address book file). The really weird thing was that the object showed up like a phone contact object, but one that had presence working. The affected user could toggle their presence, and the contact object would dutifully change itself. However, since it wasn't a Lync object, you couldn't start an IM (but you could call the associated number). This user's first name isn't actually "Admin" in case you were wondering. Another weird thing was that the very first time you pulled up that person's name from a search, it would briefly show the proper Lync-enabled account, but switch to the phone contact object view after a half-second or so. Yet ANOTHER weird thing, was that after viewing the admin account object in Lync a few times, usually after viewing the contact card, the next time I did a search for the same name, only the phone number appeared. However, I could still look at the contact object for the phone number and it would show the user's email address. As mentioned previously, the address book had the correct contact information (verified by opening the GALContacts.db file in Notepad....the results ain't pretty, but it works), as well as the information from the AD admin account, but Lync was choosing to show the non-Lync enabled admin account in searches. Both the Lync-enabled account and the AD admin account had the same email address defined. Removing the email address from the admin account, re-generating the Lync address book via Update-CSAddressBook, and re-downloading the updated address book file fixed the issue. So, what happened? When you do a search, the Lync client will look at the address book, your own Outlook contacts, and any social connectors you may have associated with Outlook (like Facebook or LinkedIn). If the same name shows up in multiple places, Lync will try to consolidate all the information and show only one contact object. Sometimes, the process goes awry. In this case, it appears that Lync saw the same email address for both the Lync-enabled AD account, and the non-Lync enabled AD admin account, and incorrectly presented the non-Lync enabled account as the single object. I'm guessing this is a bug, because Lync really should place priority on a Lync-enabled object over a non-Lync one for presentation. If you weren't able to get to Las Vegas for Lync Conference 2014, you can now see all the content online at Microsoft's Channel 9 page. 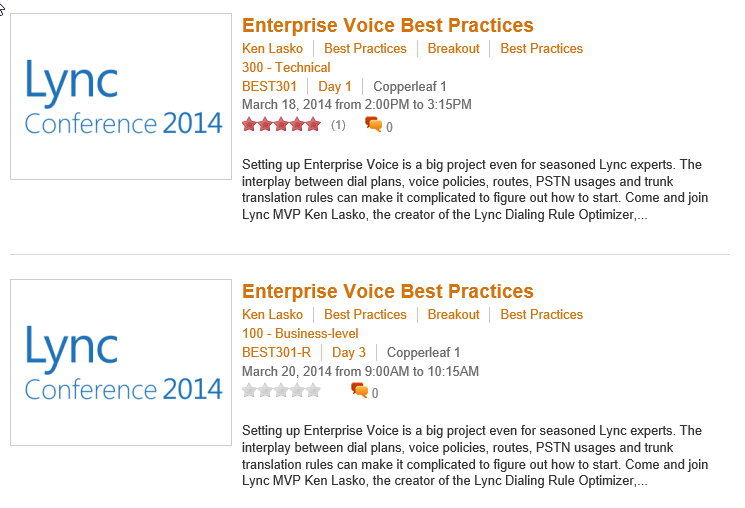 I did two very well attended sessions on Enterprise Voice Best Practices. You can see both of them online, if you're so inclined. I recommend checking out the second one on Day 3 at 9am (BEST301-R). For whatever reason, MS didn't have my most up-to-date slide deck for my first run-through, and there were technical difficulties which meant I almost wasn't able to demonstrate the Lync Optimizer. I'm always working to provide new features for the Lync Optimizer. Some have been rolled out silently to fix an issue. Others are related to country specific dialing rules. Here are a few things I've done recently that you may or may not have noticed. Recently, I was looking to implement dialing rules for Namibia, when I was faced with an issue I hadn't considered. The country code for Namibia is the same code I use for all North American dial rules (NA). To fix the issue meant I had to do something I've been meaning to do for a very long time: separate out dialing rules for the US, Canada and the other 20-odd Caribbean countries that are part of the North American Numbering Plan Administration dialing area (NANPA). All the countries in NANPA use +1 as the country code, which makes it difficult to work with programatically. To switch things so that US dial rules have a US- prefix, Canada dial rules have a CA- prefix and so on, required quite a bit of work. The end result is that no matter the country you select, the dial rule prefix will use the actual country name, so instead of NA-ON-Toronto-Local or NA-TX-Dallas-National, you'll get CA-ON-Toronto-Local or US-TX-Dallas-National. You'll still select North America as the country name. The Optimizer will be smart enough to know if the area code is in Texas, Ontario or the Dominican Republic (for example). This change is effective as of May 1, 2014. Anybody who signed up for rule updates prior to this will be unaffected. Your rule updates will still come to you using the old format. However, if you've started building dial rules for multiple North American locations prior to May 1st, and are adding more dial rules after May 1st, things may not work as expected if you have a mix of US-, CA-, and NA- prefixes. If this does affect you, please let me know and I'll put up an option to use the "legacy" dial rule format, or give you access to the "old" code. North America has an interesting situation regarding international dialing. There are 26 countries that share the same country code: +1. In the US and Canada, long distance charges to Caribbean countries that are part of NANPA are often the same price as international calls. Since it is difficult to distinguish a Caribbean country from US/Canada based solely on the area code, it is easy for people to accidentally incur high phone charges when calling these countries. In-Country Only - Treat all calls to NANPA countries other than your own as international, even though users don't have to dial 011 to reach them. As such, users will have to be a member of a voice policy that allows international dialing. US/Canada - Treat calls to anywhere in US/Canada as national calls, excluding the Caribbean. To dial Caribbean countries, users will have to be a member of a voice policy that allows international dialing. Not available for Caribbean rulesets. US/Canada/Caribbean - Treats calls to anywhere in NANPA (US/Canada/Caribbean) as national calls (along with the potentially higher call costs). If you are creating a ruleset for a Caribbean country that uses +1 as the country code, you won't be able to select US/Canada, since this would make dialing within that Caribbean country difficult. Selecting the Simple Ruleset option prevents usage of this feature, and will default to US/Canada/Caribbean. You won't be able to control how people dial other NANPA countries when there is only a single simple routing rule. I had a request to create more flexibility around how extensions are used in the Optimizer. One addition is the ability to control how many digits of the extension are part of the associated DID. For example, a company might have an extension range of 2100-2199 that maps to a DID that matches up with the last 3-digits of the extension, like +12125558100 to +12125558199 (Note the extension starts with a 2, while the DID has an 8 in its place). The Optimizer now supports this via the addition of a new column called "# of Ext Digits in DID". This will only appear when you select the DID option, and you can use the dropdown to select how many digits of the extension is part of the DID. I've added support for more countries, including Singapore and finally, Mexico. Mexico has a very strange dial plan where you have to dial mobile numbers differently than land lines, but nothing about the number tells you in advance whether or not you should dial those additional digits. If you use the Optimizer to generate dialing rules for Mexico, you should make sure your mobile numbers are stored in AD with 1 after the country code (like +521331234567), and not with 044 or 045 as you would dial. Lync will add the 044 or 045 as appropriate before it leaves Lync. I hope you like the new additions to the Lync Optimizer. If you require North American dial rules to follow the old format (NA-TX-Dallas-Local), please drop me a line and I'll help you out.